Through 2013 and 2014, I played Final Fantasy XII with my partner, Helen. I had given up on it when I first played it when it was new but had long felt a desire to return to it. (Confession: I told myself that despite disliking Final Fantasy XII’s story, I was interested in its systems. I am not innocent here.) As I played, Helen looked at a range of wikis and walkthroughs to help me on. This was a truly wonderful way of appreciating such an intricate but opaque game. No, I didn’t figure things out myself. Instead, it was the satisfaction that comes from understanding how a complex machine works. The guides really helped that and greatly strengthened my appreciation of Final Fantasy XII. The notion that players should figure out games all by themselves is oversold. So following that successful experiment, I decided it was time to give Final Fantasy XIII a go. I had never played Final Fantasy XIII when it was new. I had watched Helen attempt to play it for twenty hours or so, and I had read everyone’s predominately negative reaction to the game on social media and around the blogs. Terms like “one long corridor” or “thirty-hour tutorial” were etched into my perception of the game. Only two positive perspectives on the game countered the overwhelming negative impression: friend and fellow game academic Todd Harper’s ongoing passionate defence of the game, and this blog post by game critic/academic Simon Ferrari. Simon’s blog post in particular was vital to my learning how to appreciate this game. While everyone else was criticising it for, really, not fitting into their pre-conceived notion of what a Final Fantasy title should play like, Simon took the game on its own terms and said, here, this is why this works so well in and of itself. This is why it is satisfying. 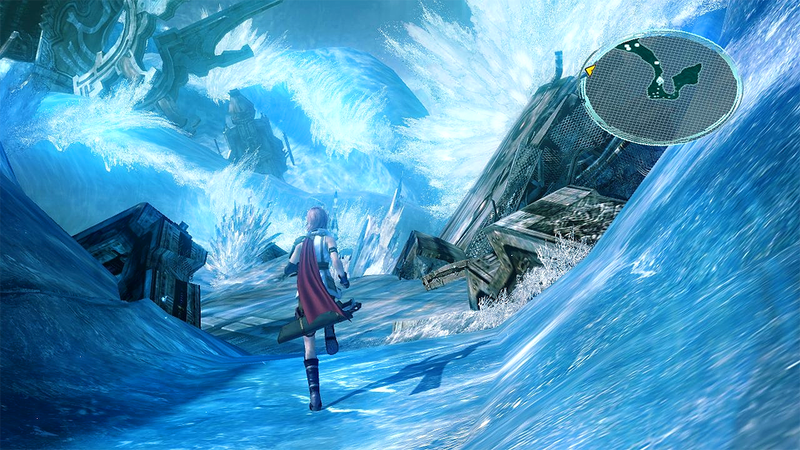 What Simon points at is how Final Fantasy XIII’s restrictively linear progression provides this incredibly slow but satisfying build up of layered systems through hills and lines. What most people expected was for the game to introduce all of its systems and then get out of the way. What Final Fantasy XIII wanted to do, however, was to over the course of the game add more and more and more systems and variables, one by one, so that playing the game is to be a part of this fractal design that slowly but constantly folds in on itself and zooms out and multiplies. You are fighting one enemy with two people. Then two enemies with two people. Then this one other enemy with two people. Then two of those first enemies and one of these new enemies with two people. Now try with these two. Okay, now try four of those enemies but with three people. Now try with this new system thrown into the mix. 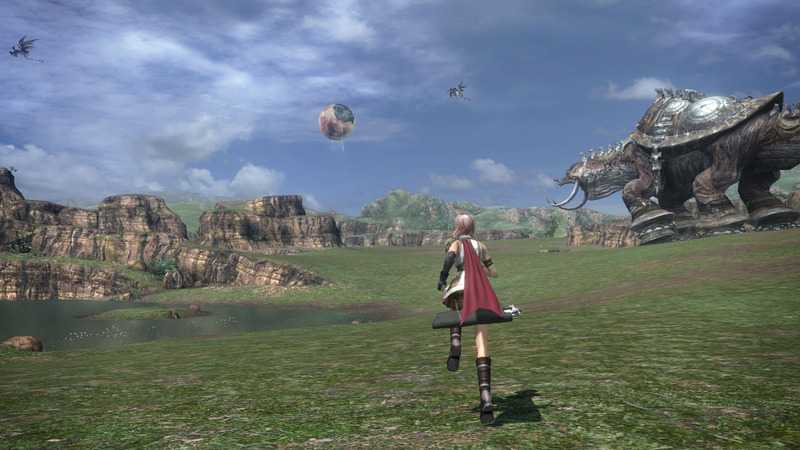 By strictly controlling the player’s progression (in terms of spatial navigation, character development, battle make-up), Final Fantasy XIII provides this unfurling of systems that will infuriate someone who just wants to play a JRPG, but which will provide the most satisfying slow burn for the patient player. Let’s keep talking about battles for a moment. When I wrote up my notes on Final Fantasy XII, I praised the move to a semi-real-time system. The design of that game was so deliberate and considered and it worked so perfectly. It allowed this nice, rolling rhythm in place of the stop-start jerking of the previous Final Fantasy titles. As much as I enjoyed them at the time, after playing Final Fantasy XII I find it so frustrating to have a ten-step adventure across a field interrupted by three five-minute battles. 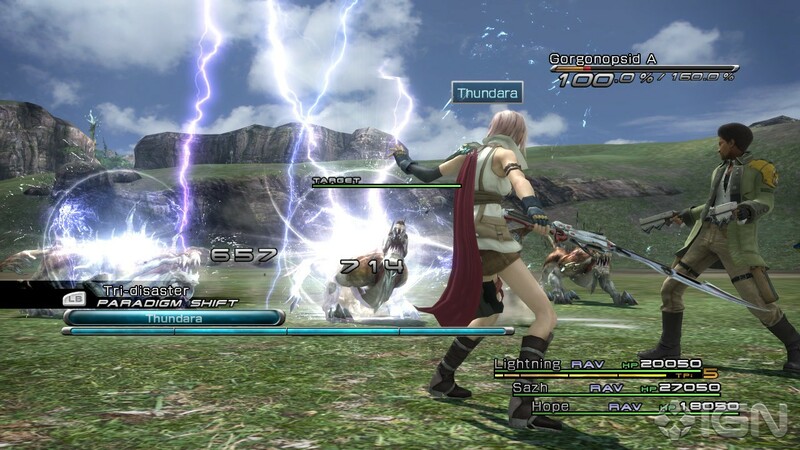 Final Fantasy XIII returns to the turn-based style of previous titles while maintaining the slickness of rhythm that modernised Final Fantasy XII. Monsters are visible on the field map, so are never an abrupt surprise. Transitions from field map to battle map are smooth and quick. The battles themselves are fast and overwhelming, with multiple characters all acting simultaneously as the camera swoops around and darts in and out to attempt (but often fail) to frame the whole action. At first I despised the ability to only control one character within battles (something XII had worked around so well), and I still dislike that the death of that one character causes a Game Over (though that a Game Over now only returns you to the start of that battle is very welcomed). But much like XII before it, XIII accepts that those things the player has already done in ten other Final Fantasy titles (choosing individual attacks and magic spells) is something it can safely abstract in order to instead provide more generalised but no less satisfying abstract control. Instead of telling characters what to do, you tell them what sort of character to be, and they take it from there. It’s less being in control of the battle and more swaying it in a certain direction. At first, it seems overly simplistic (especially before the job system is introduced) and all you are doing is pressing ‘auto-battle’ over and over. But then you get demolished by a monster and try a slightly different approach and demolish it in turn, and it is very rewarding. The answer to a difficult fight in XIII is very rarely to grind. Usually it is about approaching the battle from a fundamentally different perspective. The actual haptic feel of battles is so satisfying, even though it consists of little more than pressing X. Throughout the game I found myself just unconsciously tapping X at a steady beat, even when my input wasn’t necessary. This doesn’t speak to a mindlessness of the one-button battles, but to their ability to fully engross me so much that I just kept going. It’s hard to pinpoint just why this is. A lot of it comes down to presentation. The combination of sweeping cameras, satisfyingly filling up Active Time Bars, luring sounds, dramatic music. I felt like I was a part of the action. The battles aren’t all I enjoyed about the game. There is something more, something that is hard to pin down. It’s not ‘story’. The story is terrible. Or, more accurately, the story is told terribly. Much of the time it can be difficult to tell if something makes no sense because it isn’t meant to make sense yet or because the game has failed to explain something. Because of this, moments that should be incredibly clever come across as poorly executed. The game starts in media res and dumps a whole lot of information on you. There is this world and there is this other world. One is called Pulse and one is called Cocoon but who knows which is which. Also, this world has an inside and an outside but those are not the two different worlds. Each world has l’cie gods and also fal’cie demi-gods oh and those things are fal’cieth and there is a military and it has two autonomous components and you get the idea (or, more accurately, you don’t). If you take the time to read the datalogs in the menu (or play short enough sessions that you see each one on a loading screen when you next play), it becomes clear that the designers know how this story plays out. It makes sense in these datalogs. But as it is presented during play, it is at best incoherent (but decipherable) for most of the game. For the final part of the game, however, it is irredeemable. Until the ending, which does a lot of the work to make the many frustrating unknowns make sense (which I think explains why those I know who defend the game have played multiple times, as that would make it much more tolerable). But it never is entirely satisfying. But if I say I don’t like Final Fantasy XIII’s story, a whole lot of collateral is often dragged along with that, which isn’t what I want. Because I do like the game’s characters, and I like its words, and I like its visual flare. The game/story dichotomy we still so commonly rely on when we talk about videogames makes it difficult to appreciate things like character design while being disinterested in a story. So many Japanese game designers in particular are masters at character-driven (but not necessarily story-driven) games (Shadow of the Colossus with its literal progression of characters is probably a good example of this). I’ve come to respect Tetsuya Nomura as one such designer. XIII is entirely character driven. Each character has such a distinct silhouette and palette; none could be mistaken for another. Each of these characters has their own personality, catchphrases, poses. Their significance to a progressing story seems almost irrelevant next to my appreciation of the characters themselves as audiovisual things that I both tinker around with and watch. Each has so much… well, character. Even Hope and Vanille, the ones so easy to hate as mopey anime boy and manic pixie dream girl respectively each come into their own as rounded, satisfying characters. I am going to pause this train of thought here because I don’t have the vocabulary to talk about ‘character’ distinct from ‘story’, but that is something I think we urgently require if we are to not fall back on the crutch of ‘story’ to talk about videogame engagements beyond the mechanical all the time. As with Final Fantasy XII, Helen and I played through XIII with a guide. We returned to the same guide author, Paramina, whose entertaining writing dramatically enhanced the experience of each title. Paramina has her own favourite characters, her own most-hated plot points and enemy types. As we played the games ourselves, it felt like we were reminiscing in real-time with someone else also playing the games and also expressing bafflement at different plot points or battles. It provided such a delightful change from dry, dot-point, strictly formal walkthroughs that I am more used to. It allowed our playing of the game to feel almost social. If you wish to attempt Final Fantasy XIII yourself, I can’t recommend enough that you do it with Paramina’s guide by your side. As with XII, understanding XIII’s systems was more satisfying than figuring them out. I would sometimes ignore Paramina’s advice (out of a laziness and not wanting to move all my paradigms around) and get hammered instantly by a battle. I would then try her way of doing things and watch in amazement as the enemy’s health just drained to nothing in a flash. I was not figuring out things myself, but I was understanding how things work, and it was deeply satisfying. Final Fantasy XII and XIII have together given me a new respect for the post-IX Final Fantasy titles. Even up to five years ago, I think I was too invested as a consumer in the Final Fantasy brand and what a Final Fantasy ‘should’ be. Ironically perhaps, now that I no longer care about Final Fantasy in any brand loyalty sense, I am finding each Final Fantasy all the easier to enjoy. I have become enamoured at the franchise’s ability to completely reinvent itself from a solid grounding each and every game. Not just a new story or a new system, but a new videogame where the overlapping conventions are more qualitative than quantitative. It’s a constant reinvention that few long-running franchises can boast (Mario being an obvious exception). These titles have each challenged how I appreciate Final Fantasy titles, but also how I appreciate videogames generally. They have forced me to start looking for other evaluative terms and vocabularies that move me beyond a reductive game/story dichotomy (or perhaps, rather, they helped me realise that I was still working within such a dichotomy without being aware of it) to instead find ways to think of ‘style’ and ‘rhythm’ that can account for tapping buttons, flamboyant visuals, intricate characters, the swiftness of loading screens, sound effects and musical movements (I believe Final Fantasy XIII to have some of the most mature, confident, and understated music of the series) all as equally relevant. This all feels like stuff I’ve said before, but appreciating Final Fantasy XIII makes the whole project seem all the more urgent. This entry was posted in Notes and tagged final fantasy, final fantasy xii, final fantasy xiii, Notes by brendankeogh. Bookmark the permalink.